This past weekend has been a bit of a disaster when it comes to listening. Anna had three major meltdowns over minor things and some ridiculously stressful mornings as a result. We’ve also hit a high point with sass and back talking in the house of Lev and it’s becoming problematic for everyone (including the dog). I introduced the idea to her after school and she couldn’t wait to get started. (SCORE!) She even begged me to ask her to do something just so she could listen and get a subsequent punch in her card. It was so effective, that after the first day she had one full card punched, earning her a special art project together (nail polish painting on rocks) AND made her way through the majority of a second card. Both the husband and I are thrilled at how well it worked and are looking forward to seeing how it will go over time. Fingers crossed it continues to be an effective tool for us when it comes to listening. 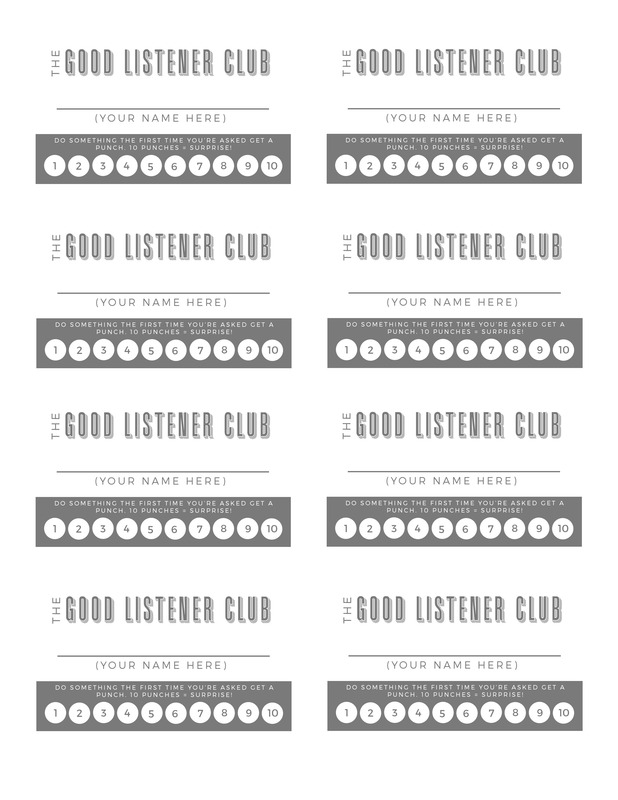 I sat Miss Anna down when she got home from school and explained to her what The Good Listener Club was and how the punch card will work. Like it says on the card, she gets a punch every single time she does what is being asked of her the very first time. This is something we really struggle with and generally have to ask 4-5 times before someone gets frustrated and stomps off (I wish I could say that was just her). Instead of letting it get to that point, I wanted to nip that behavior in the bud and significantly decrease the amount of times we have to ask her to do something and the subsequent frustration that comes with being ignored (or nagged, for that matter). Once I explained how the card and the punches worked, we sat down and talked about the different things she could unlock after getting 10 punches on her card. For Anna, the most exciting and motivating things were time playing on Osmo (affiliate link), extra screen time or a movie, lip gloss use for the day, a special treat like mini ice cream cookies or popsicles, a trip to the library, and an extra story at bedtime. Side note: I have found that sitting down with Anna to create a list has been the most effective way to get her on board with something and to help her feel like she has a say in what happens. Thank you How To Talk So Kids Will Listen (affiliate link) for that nugget of awesome! Once she felt good about the punch card and was clear on what was expected of her, we were off and running. I can’t even begin to tell you how excited she was to punch out a circle and even begged me a few times to ask her things so she could listen and get another punch. I posted on Instagram about the punch card idea and my desperation with the whole not listening thing and had a handful of people a.) telling me they are in the same boat and b.) asking if they could use the template as well. So, I figured I would share it here as well so that anyone who needs some help with listening in their house can download it and use it with their kiddos, too. I am currently using the pink one since that’s Anna’s absolute favorite color, but also made it in blue, green, and grey. Feel free to download whichever one (or all) that you want! Print on a light piece of heavy cardstock at 100% size. It may give you a warning saying that the image or document is larger than print size. Just ignore and print anyway. The margins are wide enough that it prints out perfectly on the paper as it is. I used a rotary trimmer paper cutter (affiliate link) to trim the cards to be 3.5 inches wide by 2 inches tall, the size of a standard business card. Use the pink box at the bottom as your guide for the side and bottom cuts as they are to the edges and then measure 2 inches from the bottom for your top cut. I’d love to hear how this works for you (good or bad). Make sure to tag me @emilylevenson AND use the #madewithlev hashtag when posting on Instagram.